REVIEW OF Connie L. Scarborough. Viewing Disability in Medieval Spanish Texts: Disgraced or Graced. ➜ REVIEW OF Connie L. Scarborough. Viewing Disability in Medieval Spanish Texts: Disgraced or Graced. This interesting new study of disability in medieval Spanish literature will be seen as both useful and frustrating in equal measure. Connie L. Scarborough is a well-known specialist in Castilian literature (this is what is meant by Spanish literature in the title) and she knows her chosen texts inside out. The range of texts in this book is rich. Scarborough uses multiple genres: chronicles, miracle collections in verse, fables, mirrors or guides for princely behavior, troubadour poetry, courtly epic, satire, proverbs, and romance, most of which date from the thirteenth and fourteenth centuries. Historians of medicine have undoubtedly neglected some of these genres for their insights into health. The volume is useful in that it presents some little-known texts to a wider audience and draws on them quite well to provide some understanding about medieval Castilian beliefs and attitudes toward people described as sick and impaired. The frustrating aspect of the volume is its lack of context. 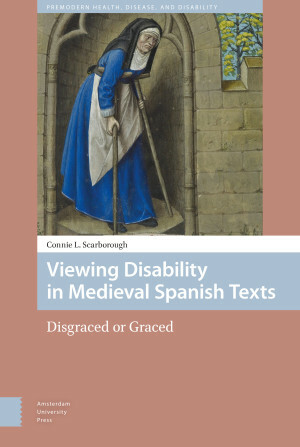 The author explains in her introduction: “While students and researchers in the field of Spanish medieval literature will be familiar with many of the texts I include in the following chapters, I hope they will discover the disabled characters they may have overlooked in previous readings” (p. 13). This is undoubtedly a worthy venture for such students. However, the quotation reveals the main problem with Scarborough’s book: the very narrow audience that she envisaged while writing it. At no point does it seem to have occurred to the author, or the editors of the new series Pre-modern Health, Disease, and Disability in which it is published, that this book would appeal to an audience that might know little about medieval Spanish literature (such as potentially many of the members of H-Disability). The book starts with an introduction to disability studies and general medieval attitudes toward impair- ment and illness. It then devotes a chapter each to par- ticular kinds of impairment or illness: lameness, blind- ness, deafness and inability to speak, and leprosy, before ending with a chapter on miracles “cured by the grace of God,” which unfortunately repeats some of the earlier examples (p. 165). There are undoubtedly issues with ret- rospective diagnosis, translation, labeling, and terminology, but rather than dwelling on these aspects it is impor- tant to point out the religious framework used through- out and expressed by the book’s subtitle: Disgraced or Graced. Although in a footnote the author notes “that there was a diversity of opinion about the association of sin with disability in the Middle Ages,” the decision was taken to follow that approach without discussing any other in much detail (p. 19n25). An extra chapter on the texts and their authors and some guidance on how to read them in relation to the politics, medicine, religions, and culture of the kingdom of Castile would have transformed this book. It would have added some much-needed depth, debate, and texture. For example, one of the most important texts is the Canti- gas de Santa Maria (Songs of Holy Mary), a collection of over three hundred poems dedicated to the Virgin Mary ordered to be compiled by King Alfonso X of Castile in the mid-thirteenth century. Readers of the present book who do not know this literary source will perhaps be confused as to why they are offered examples of healing miracles from this text in settings that range from imperial Rome to twelfth-century France to the court of King Alfonso himself. The Cantigas brings together Marian miracles from across much of Europe and includes some early Christian stories, but this is never explained. A contextual chapter might also have allowed space to provide more awareness of the work that scholars of medicine and literature, especially in the modern Iberian Peninsula and in the United States, have done in several languages on medical texts, institutions, diseases, and practitioner-patient relationships during the period and region in question, and beyond. At no point is any of the work of Luis García Ballester on health in medieval Castile cited. No attention has been paid either to Catalan, Portuguese, or Navarrese texts and contexts, despite all the work that has been done on wider Iberian health by many scholars, or to the great need for comparison across kingdoms and across Europe. In fact, there seems to be no secondary literature cited at all on anything published since 2014, which is a problem in a fast moving field. A major omission is Jonathan Hsy’s essay on disability in the Cambridge Companion to the Body in Literature (2015), which engages with one of Scarborough’s key texts: the Arboleda de los Enfermos (Grove of the Sick) by Teresa de Cartagena, in which, uniquely for this pe- riod (the mid-fifteenth century), she describes her personal experience of being deaf. Having said all this, it is essential to say that this book is full of fascinating examples worthy of much more comparative in-depth study. Some of the motifs that it describes—for example, the associations between ill- ness and imprisonment—are striking. It is also true that many of these texts express profoundly moralistic atti- tudes that link impairment and punishment in negative ways. Studied in isolation without much context, these examples might confirm some modern views that life in the Middle Ages was grim and that medieval society was profoundly prejudiced against those perceived to be im- paired. Future work needs to take these representations of illness and subject them to much deeper analysis that takes into account genre, transmission, translation, and style, while setting them side by side with historical and bioarchaeological evidence that might provide a differ- ent picture. This book is recommended for its presenta- tion of less well-known texts in a very readable way, but in the future there should be much more collaboration between scholars from all the disciplines keen to under- stand disability in the past. It is not just a question of the sciences and the humanities working together—often put forward as a desideratum in the history of the health of past populations—but also a question for more of the humanities subject areas to work together toward their common goal of understanding the human condition. Review:Bianca Frohne Cordula Nolte, Uta Halle and Sonja Kerth, eds. Dis/Ability His- tory Der Vormoderne: Premodern Dis/Ability History. Review of Melanie Yergeau. Authoring Autism: On Rhetoric and Neurological Queerness. Raleigh: Duke University Press Books, 2018.